Lunar Occultation of Antares Tonight! An interesting celestial event is within easy reach of a pair of binoculars or a small telescope, on the night of the 31st of July, from all over the country. The occultation of Antares by Moon occurs around 9:55 P.M. in Kathmandu while 9:52 P.M. in Bhairahawa,9:54 P.M.in Biratnagar,9:55 P.M. in Chandragadi,9: 53 P.M. in Janakpur, ,9:52 P.M. in Nepalganj and 9:53 P.M. in Simara. A Lunar occultation could be the passing of the Moon in front of any other distant celestial Object - a Planet, other Solar System objects, a distant Star, or a deep sky object. Of these, the passage of the Moon in front of the naked eye Planets or bright stars, is an event that is most accessible to people without any observing equipment.And tonight is the time for the bright star occultaion by Moon. Hundreds of thousand of Neplese People watched Total solar Eclispe on July 22, 2009. 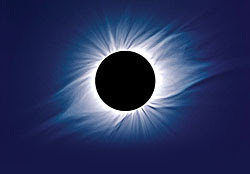 The longest total solar Eclipse of 21st Century that crossed the half of the world took placed on Wednesday, 22 July, 2009.The once in a life time Total Solar Eclipse viewed from 14 districts while the partial eclipse observed from remaining 61 districts of Nepal from 05:45-07:47 hours in the morning. Maximum of 3:49 min of totality was seen from Bhadrapur according to our prediction. People from the path of totality felt strange during the Totality as their animals behaved as if the night had come. 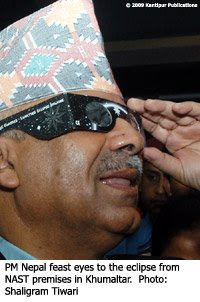 Nepal First Total Solar Eclipse Observation Campaign concludes with the grand Success! 40th Anniversary Of Apollo 11. Forty years ago the astronauts of the Apollo 11 mission lifted off for the moon.Lets celebrate this great evening tonight! Nepal Astronomical Society(NASO)is spreading news regarding through different means Total Solar Eclipse in Nepal which is the longest Total Solar Eclipse of 21st Century for the public awareness and the safe observation of the Solar Eclipse.People from 14 districts of Nepal can enjoy the spectacular view of the Total Solar Eclipse from 05:45 to 07:47 NST while rest of 61 districts will observe the partial Solar Eclipse. Regarding the generating awareness to the public NASO has been conducting the training for local people and the Students of Schools and Colleges of Kathmandu How To Make a Pin Hole Projection Box?. Rijendra Thapa of Nepal Astronomical Society(NASO) will be in Daejeon,Republic of Korea to participate 60th International Astronautical Congress during 12-16 October,2009. 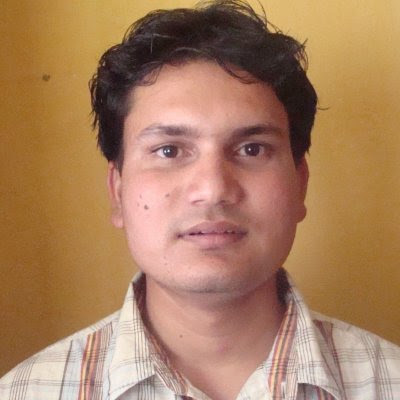 We,Nepal Astronomical Society(NASO) are very honored as our member has been awarded The First International Astronautical Federation (IAF)Youth Grant.The IAF has awarded the Youth Grants to the ten students and young professionals including Rijendra Thapa from Nepal from over 130 well-qualified applicants from 35 countries. The 100 Hours of Astronomy judging committee has returned their final results! Congratulations to all the clubs and individuals who have been chosen. Your efforts, insight, and commitment have inspired us all and we are honoured that you helped to make this project such an unprecedented success. For those of you who submitted an award application but did not win, please know that judging for these awards was very difficult. The calibre of the events overall was amazing! If we had twice as many prizes to award, we could easily have chosen twice as many winners, we definitely were impressed with all the submissions. We will highlight our 8 major winners from all categories below on our website shortly. Thank you all for submitting entries, but most of all, THANK YOU for making 100 Hours of Astronomy such an great event. Award One - Largest number of registered events held by a single astronomy group, club or society. A new DNA analysis of hairs found in a book that once belonged to Copernicus shows a match with the great astronomer's putative remains, seemingly confirming their identity. Nicolaus Copernicus, a Polish mathematician, astronomer and Catholic cleric (among many other pursuits), developed a heliocentric model of the solar system, opposing the widespread belief that the Earth was the center of the universe. 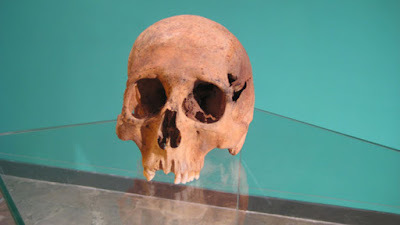 The bones were found close to the altar Copernicus was responsible for during his tenure as priest, and forensic facial reconstructions using the skull look similar to portraits of the man. A team of Swedish and Polish researchers sought to more firmly ID the remains by comparing the DNA of the remains to that in hairs found in a calendar (now exhibited at the Museum Gustavianum in Uppsala, Sweden) that belonged to Copernicus for much of his life. A penumbral lunar eclipse took place on July 7, 2009, the second of four lunar eclipses in 2009. This eclipse entered only the southernmost tip of the penumbral shadow and thus was predicted to be very difficult to observe visually.This is the second of the four Lunar Eclipses in 2009. A penumbral lunar eclipse is a phenomenon in which the Sun, Earth and Moon line up in tandem, hence the Moon is in the Earth's penumbra, or, when you look from the Moon, the Sun is partially covered by the Earth (partial eclipse.) During this phenomenon, the volume of sunlight to the Moon decreases, and the Moon's surface looks darker when you look at the Moon from the Earth. Japan's Kaguya spacecraft, which circles around the Moon on its polar orbit, can witness this phenomenon only twice a year at most and it has already captured such a view on February 10, 2009, in a geometry remarkably similar to that of yesterday's eclipse. Darkness after sunrise:Are you ready for the first and longest solar eclipse of the 21st century? Whatever you are doing on the morning of 22 July, drop it. Get up early. Get ready for the astronomical event of the century: you're not going see a total solar eclipse that lasts this long again. The total eclipse, the first since in 2006, will traverse a path that begins in India, passes through Nepal, Bhutan, Burma and then to China and the Pacific Ocean. Those who see no distinction between astronomical events and astrology, say the timing is ominous. Eclipses are regarded as a bad omen and could portend more political turmoil ahead. Whatever its mythical or political significance, the eclipse will be a spectacular sight. Cross your fingers and hope that the monsoon clouds will part and allow us a good view. But even under the cloud cover, there will be total darkness beneath the umbral shadow for about 3.5 minutes.